In the late 1970’s and early 1980’s, Atari was the dominant player on the home video game market with their 2600 console. While Intellivision offered better graphics, the game library gave Atari the upper hand especially when they licensed home versions of popular arcade games, Pac Man and Space Invaders. In the early 1980’s, Steven Spielberg was instant box office success. Aside from 1979’s 1941, Spielberg was a box office sensation with Jaws, Raiders of the Lost Ark, as well as producing Poltergeist. Spielberg was producing hit after hit for Universal Pictures and Atari was owned by Warner Communications, which also owned Warner Brothers. Stephen Ross, head of Warner Communications wanted to be in business with Spielberg, so he ponied up $20-25 million to Spielberg and Universal to make an E.T. video game, which was an obscene amount of money for video games that were selling for less than $40 a cartridge in the Summer of 1982. E.T. was a box office smash that summer, so Atari wanted to crank out a game in time for Christmas 1982. It gave the developers only six weeks and when you’re dealing with 1982 technology, that’s not a lot of time. A sign that the game was a disaster in the making was the fact that Spielberg didn’t like it. Spielberg wanted a Pac-Man like game, instead of what was developed: a game where E.T. would need to call home, similar to the plot of the movie. The problem with the game is that it looked dreadful and blurry with tow many instances where E.T. falls down a hole, it was limited by the graphics of the Atari 2600 console. Looking to cash in on a hit movie and Christmas, Atari produced about 4-5 million cartridges for sale. Sales were at 1.5 million despite the negative reviews, but Atari had an inventory left of almost 3 million cartridges. One funny aspect of the 4 million cartridges is that while 20 million Atari 2600 consoles were in the market, it’s assumed by Atari employees that there were less active consoles in the market than E.T. cartridges produced. The E.T. debacle led to the video game crash of 1983 which destroyed the home video game console market for several years until Nintendo was able to bring it back in 1989-1990 with the NES console. Atari buried millions of those E.T. cartridges in a New Mexico landfill. 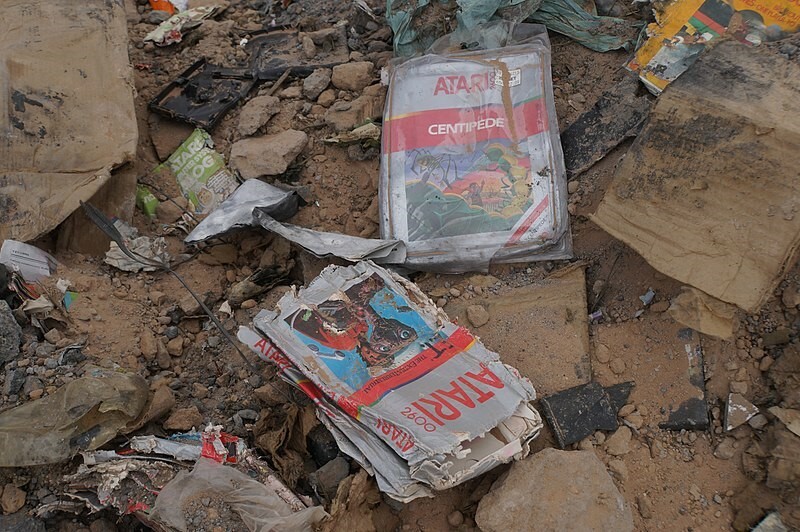 Many claimed that the landfill dump was an urban legend until an excavation proved the burial in a 2014 Atari documentary.